ab46795 reacts with mouse CD49b, Mr 160-kDa. RIL 2 propagated NK1.1+ cells from C57BL/6 mice. (Fusion Partner Mouse SP2/0 myeloma cell line). Our Abpromise guarantee covers the use of ab46795 in the following tested applications. Flow Cyt Use 0.2µl for 106 cells. FACS analysis of B6 splenocytes, doublestained with rat anti-mouse CD49b (integrin alpha 2)-APC/Cy7 (ab46795) at 0.2 µl/106 cells and CD3-FITC. ab46795 has not yet been referenced specifically in any publications. Publishing research using ab46795? Please let us know so that we can cite the reference in this datasheet. I bought your DX5 cod ab46795, but It is not clear to me if this clone is for BALB/c or for B6, as in your daata sheet is for B6 and other vendors is for BALB/c. "The immunogen used to produce this antibody was RIL-2-propagated NK1.1+ cells from C57BL/6 mice, though this antibody stains the majority of NK cells in numerous mouse strains including Balb/c. I have attached the technical bulletin for your reference. " From the refference:" The antibody stains the majority of NK cells and a small subpopulation of T cells in all mouse strains tested (e.g., A/J, AKR, BALB/c, C3H/HeJ, C57BL/6, C57BL/10, C57BR, C58, CBA/Ca, CBA/J, DBA/1, DBA/2, SJL, SWR). 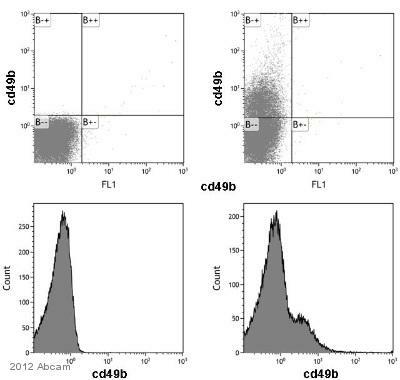 Three-color flow cytometry analysis has revealed that most cells that express NK-1.1 (NKR-P1C) also express CD49b. However, small subsets of DX5+NK-1.1- and DX5-NK-1.1+ cells can be found, especially among the CD3+ population of T lymphocytes. I hope this helps.Please let us know if you have any other questions.